Cosy, 3rd-floor studio decorated in contrasting red and black colours. 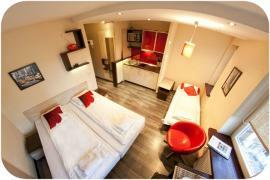 Equipped with LCD satellite TV, DVD player, free Wi-Fi and kitchenette, washing machine. We would like to inform you that it is possible to accomodate larger groups of guests in the same location in the Top 1, Top 3 and Top 4 apartments.